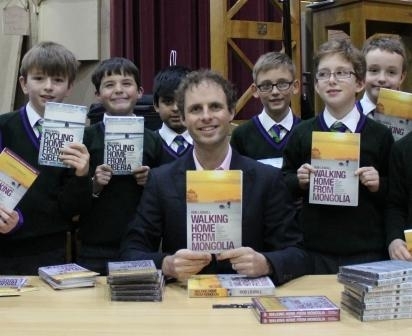 Explorer, author and motivational speaker Rob Lilwall, took time out from his busy schedule to visit Westholme School to talk to Year 5, 6, 7 & 8 pupils about his 3 year long expedition Cycling Home From Siberia. Robs route from Siberia with just his bike (and the help of the occasional boat!) took him through many countries including Japan, Australia & Afghanistan. He spoke of meeting friendly locals who at times gave him much needed support – one of whom even welded his bike back together! Rob shared photographs, videos and stories which depicted some of the challenges he faced along his travels. He endured an extremely cold Siberian winter, saw the remoteness of the Australian outback along with its high temperatures and navigated his way through the frightening jungles of Papua New Guinea. During his three year journey he experienced highs and lows. He was robbed at gunpoint, caught malaria but happily met his wife-to-be during a stay in Hong Kong. His audience were clearly inspired by his determination and strength. Rob emphasised how we should all go and discover the world to see what’s out there. He encouraged the pupils to try their own adventures albeit on a smaller scale than his! Rob is continuing to explore and another recent expedition was his Walking Home from Mongolia journey. All expeditions have been in aid of charity and Rob has raised a tremendous £80,000 so far! We would like to say a huge thanks to Rob for coming to Westholme and sharing his journey with us.